Apologies, ticket sales for QueerExpo have ended. Standard, Day Pass and some VIP tickets will be available at the event. One day tickets are $55, two day tickets are $80. Queer Expo 2 is here!! We have an ALLSTAR line up, which we are racing to announce, and we can’t wait to share with you some of the new ideas and improvements we have made to Queer Expo! First and foremost, our new Venue is the beautiful St Kilda Town Hall! Easy to get to, accessible, and with a variety of cafes, restaurants, hotels, and public transport, this iconic new venue will be familiar to most for its location! HOWEVER, this venue has a size restriction. As such, tickets are EXTREMELY LIMITED! So don’t delay in getting yours now! Next, we will be pushing back our doors-open to 11am for both days at the expo. No one wants to get up at 5am to get their face on, so we decided a late start with a slightly later finish makes for a better experience for all. We have simplified the ticketing system this year. There are 4 types of tickets available. PLEASE NOTE: PHOTO, AUTOGRAPH AND MEET & GREET TICKETS DO NOT GRANT ADMISSION TO QUEEREXPO. YOU MUST ALSO PURCHASE AN ADMISSION TICKET TO ENTER. This year, we are focusing wholly and exclusively on Queer Culture! Our Exhibitors, Guests, and general direction of the expo will be less “Pop Culture”, and focus on the things you told us that you love! and local Drag Star and winner of last year's Drag Comp Bebe Gunn! 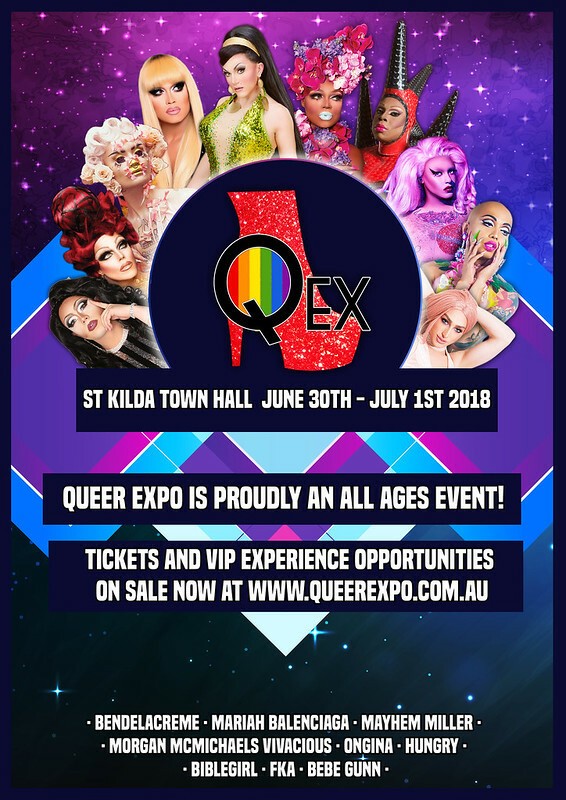 Visit www.QueerExpo.com.au for more info and to purchase your tickets RIGHT NOW!